App revenue models fall into one of three categories, pay per download where the user purchases the application, in-app advertising in which revenue is generated by users clicking on ads, and finally, the basis for this free download revenue model, in-app purchases which is monetized by users purchasing virtual goods or premium features. The in-app purchase revenue model is one often applied to free to play mobile gaming applications such as Candy Crush, and this revenue model spreadsheet provides a quick and easy method to estimate in app revenue generated by such an app for the next 5 years. The revenue forecast generated can be used as starting point for our Financial Projections Template for inclusion in a free to play in-app purchase business plan. Monthly active users, often abbreviated to MAU, is the number of unique users who engage with the app at least once per month. Enter the monthly churn rate for each year. This is the rate at which customers are lost each month. For example, if the churn rate entered under the heading year one is 55%, then for each month of year one, 55% of the customers at the start of the month will be lost by the end of the month. Enter the MAU additions for month 1. To start the in-app purchase revenue model calculations, an estimate of the number of new monthly active users (additions) for month 1 is required. Enter the MAU monthly growth rate for each year. This is the rate at which new monthly active user additions grow each month. For example, if the monthly active user growth rate entered under the heading year one is 10%, then for each month of year 1 the new monthly active user additions will grow by 10% of the previous month additions. Enter the opening number of monthly active users. Enter the number of monthly active users that the in-app purchase business has at the start of year 1. For a new business this will be zero. For each of the five years the in-app purchases revenue model spreadsheet calculates the number of monthly active users at the start of the year, the number which were added during the year, the monthly active users which were lost during the year, and finally the number of monthly active users at the end of the year. It should be noted that although the monthly active user numbers are summarized and shown on an annual basis, they are in fact calculated by the in-app purchase revenue model spreadsheet on a monthly basis. Enter the DAU/MAU %. The in-app purchases revenue model uses the daily active users (DAU) to calculate revenue generated by the app. In order to convert the monthly active users to equivalent daily active users, the DAU/MAU percentage is used. The DAU/MAU percentage is the ratio of the daily active users to the monthly active users, and typical ratios for public gaming companies can be found online. The percentage is an indicator of the engagement or stickiness of a game, and for a successful mobile gaming app can be in the region of 20%. Enter the DAU to paying user conversion %. The DAU to paying user conversion % shows the percentage of the daily active users who convert to paying users and make an in-app purchase. Enter the ARPPU. For each year enter the average revenue per paying user (ARPPU). This is the amount of revenue each paying user generates on a monthly basis. If there is more than one type of user a weighted average should be used. 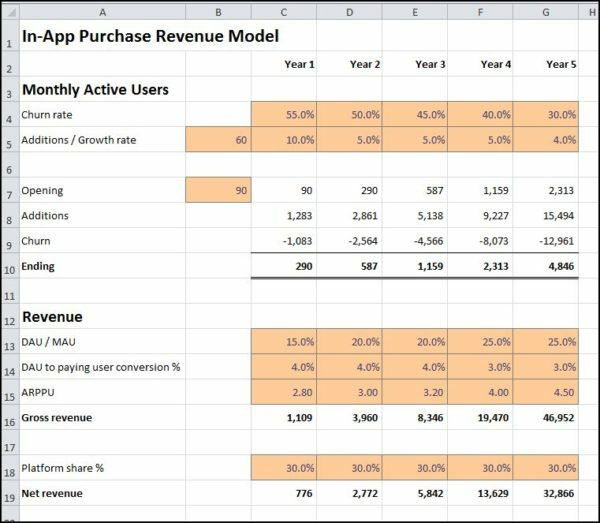 For each of the following five years, the in-app purchase revenue model template calculates the annual revenue based on the number of monthly active users at the end of each month, the DAU/MAU percentage, the DAU to paying user percentage, and the ARPPU. The in-app purchase revenue model template is available for download in Excel format by following the link below. The in-app purchase revenue model forecast produced by this template can be used as the starting point for our Financial Projections Template, as part of a free to play in-app purchase sales model business plan. Users use the in-app purchase revenue model financial projection template to generate revenue projections at their own risk. We make no warranty or representation as to its accuracy and we are covered by the terms of our legal disclaimer, which you are deemed to have read. This is an example of in-app purchase startup revenue model that you might use when considering how to build free to play in app monetization online business models. It is purely illustrative of an internet business plan. This is not intended to reflect general standards or targets for any particular company or sector. If you do spot a mistake in this in-app purchase business model example, please let us know and we will try to fix it.